Pictured from left: Nacogdoches Miller, Tildon Johnson, Jacob Lindberg, Chas Jenkins, Leeann Akers, Bryan Courtney and Logan Pemberton. 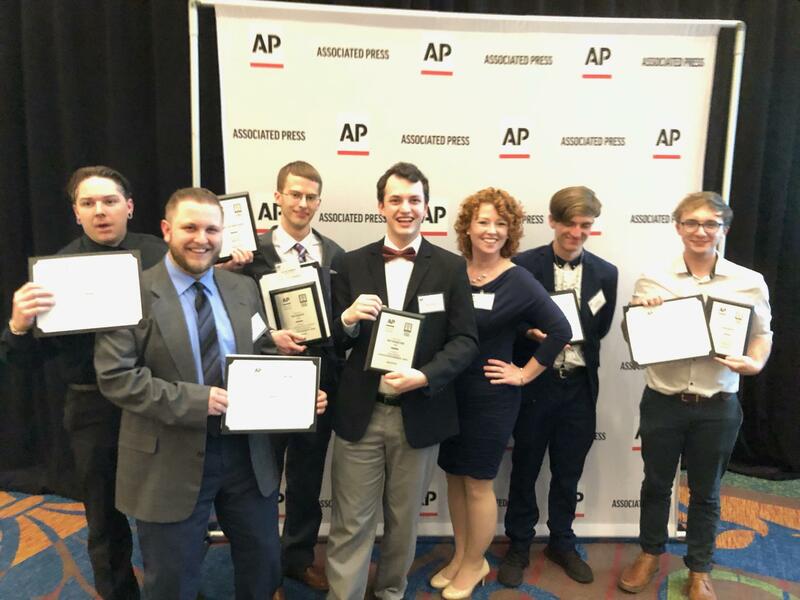 Morehead State Public Radio (MSPR) staff and students took home a total of 13 awards at the Kentucky Associated Press Broadcasters (KAPB) competition held Saturday, April 13, in Lexington. The awards recognize the best in television and radio journalism in 2018. The awards were announced for both professional and college entries. The KAPB awards competition is designed to recognize Kentucky AP members and staffers for outstanding performance in broadcast journalism. The competition is open to all AP members in Kentucky and outside Kentucky with designated market areas that extend into Kentucky. To be eligible to enter, entries must be about news, features or sports that occurred solely in Kentucky. Entries must have been broadcast in calendar year 2018. The KAPB college competition is designed to recognize Kentucky student broadcasters for outstanding performance in college broadcast journalism. The contest is open to any college in Kentucky. Entries must have been broadcast in calendar year 2018. The AP is a not-for-profit news cooperative representing 1,400 newspapers and 5,000 broadcast stations in the United States. Morehead State Public Radio (WMKY, 90.3FM) earned a total of 13 awards in the professional and college divisions including five first place finishes. Serving more than 20 counties throughout eastern Kentucky, Ohio and West Virginia, Morehead State Public Radio (WMKY) broadcasts at 90.3FM from the MSU campus.